Lawrence Berkeley National Laboratory (LBNL) designed and built for FRIB the superconducting magnet for the high-performance source of heavy ions, the electron cyclotron resonance (ECR) source. The Berkeley Center for Magnet Technology (BCMT) at LBNL to design and build the state-of-the-art magnet. Since the ECR source will provide beams of ions as heavy as uranium it must be capable of high current and high charge states (13.5 particle microamperes (pµA) and 33+, respectively, for uranium). 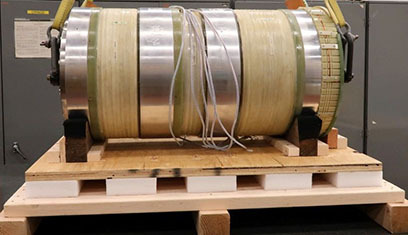 This task was a natural for LBNL, where the ECR source VENUS (Versatile ECR Ion Source for Nuclear Science) had already been built for the LBNL Nuclear Science Division’s 88-Inch Cyclotron. The performance of VENUS in producing intense high charge state beams was crucial in demonstrating the feasibility of the FRIB design concept. The design phase was led by LBNL’s Accelerator Technology and Applied Physics (ATAP) division at LBNL, and construction commenced after a successful design review in September 2014. BCMT staff worked closely with the FRIB front end team to bring the project to fruition and ensure proper integration of the ECR magnet in its environment. For more information on this collaboration, read the feature in the ATAP newsletter. FRIB partnered with the Berkeley Center for Magnet Technology at the Lawrence Berkeley National Laboratory to design and build a state-of-the-art magnet.